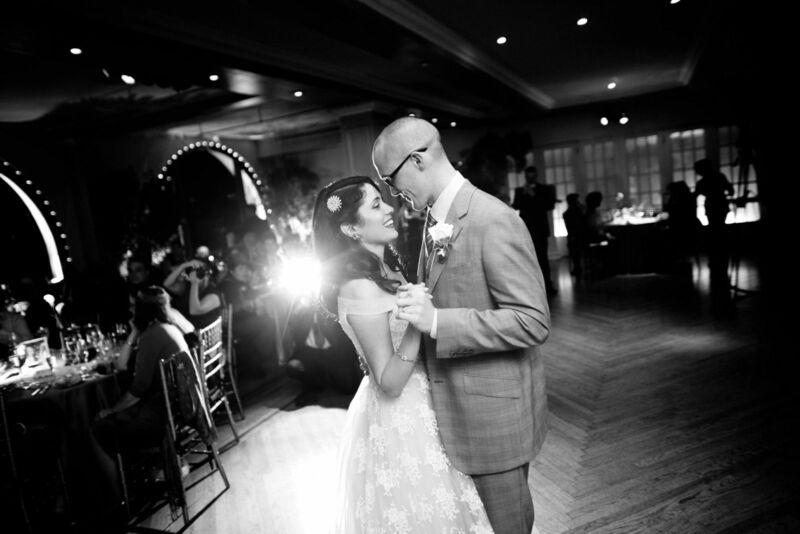 AMDA | AMDA News - AMDA Alumni Meet, Marry And Form Their Own Production Company For Charity! AMDA Alumni Meet, Marry And Form Their Own Production Company For Charity! AMDA alumni Michael Scott King (2004) and Mariya Tsekalo King (2005) both graduated AMDA but did not know one another while in school. 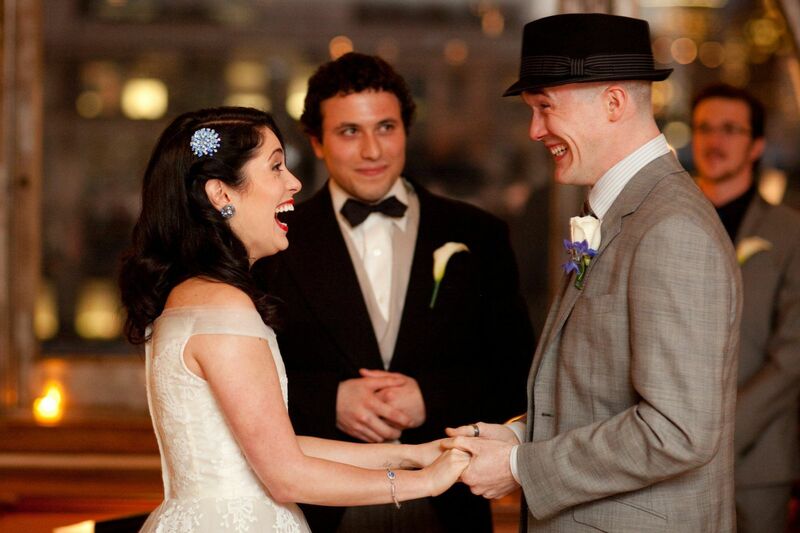 They met after graduation at an alumni audition for a weekend of Tennessee Williams plays. Two and a half months later they were engaged, and two years later they started their own production company, Nunya Productions. Michael and Mariya had not only a love for acting in common, but also found a similar history of addiction and recovery. Finding their way through serious difficulties in their own lives, they have made it their mission to give back by donating funds from all of their productions to non-profit organizations in need. 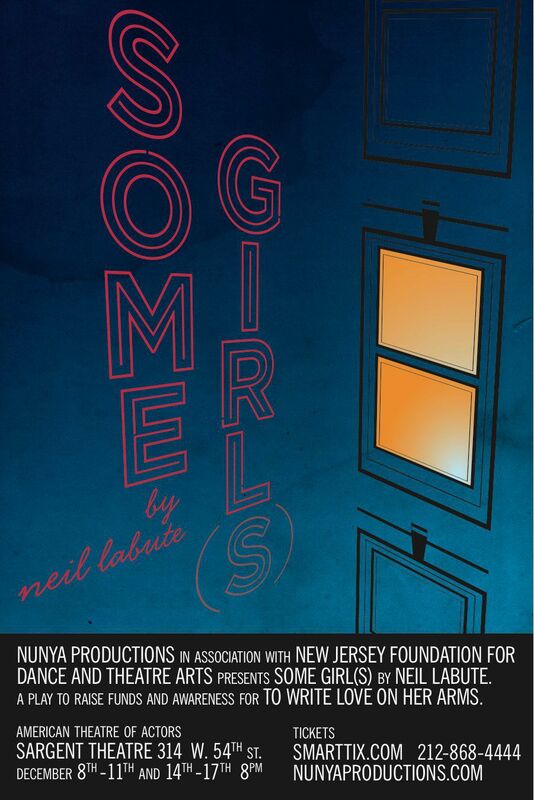 For their next event, Nunya will stage the new version of Neil LaBute’s Some Girls for the first time in NYC. The show will debut December 8th at the American Theatre of Actors' Sargent Theatre (314 W. 54th Street). We spoke to the couple to find out how they made their own dream into a reality. Mariya: I am originally from Kiev, Ukraine. I lived there until I was 6 years old and then I moved to Edison, N.J in 1992. Mariya: To describe my experience at AMDA I first need to explain what state of mind I was in when I entered. All through high school I had battled with depression, cutting, anorexia, and bulimia. I went to a very competitive public high school and my family was not supportive of my pursuit of Acting. On a whim, I applied to AMDA. The moment I read my acceptance letter was one of the most invigorating and exciting of my life because I finally had my escape. I entered AMDA 2 weeks after high school graduation with the notion that all my problems would be gone after I was famous. I thought that I would just put in the work, and then everything else would fall into place. But as all AMDA graduates know, that is not how it works. Acting is not anything you can master in a year or 5 or 10 and neither are the problems that I brought with me. Let me tell you, going through a strict conservatory program like AMDA with a low self esteem is neither fun nor productive and will hinder you from taking advantage of the great resources that AMDA has available. I was extremely distracted with my ongoing personal battles. What I will say about AMDA is that it gives you all the tools you need, it puts you in touch with people (your teachers) who know what it's like to be a working actor. When I finally started getting healthy, the lessons I learned there started to sink in, I began applying the tools I had been given, and it started working. And although not all at once, I did make the lifelong friendships that I had hoped for. Michael: My AMDA experience was very positive for me. I was able to put my head down and work on the only thing that was ever able to distract me from my struggle with addiction; art. Just prior to AMDA were some of my darkest years. I knew this school was a chance to soak up and study as much as possible. I have always had a thirst for knowledge and theatre has been the only constant positive influence in my life. I feel that AMDA had the tools and knowledge available for me to understand my craft. All I had to do was reach for them and take this experience as my new start. You both struggled with difficult personal issues in your younger years, how did you come to a place of recovery? Mariya: I have been in a state of "recovery" for almost as long as I've had problems. I was put into an in-patient treatment center for my eating-disorder my freshman year of high school. This was followed by weekly therapy sessions, medication, and two more in patient centers after several suicide attempts. I relapsed into my eating disorder through all of high school and my years at AMDA. By the time that I had met Michael, I was more or less in a better state but still had very negative thinking. Although Michael's addiction problems were different from my own, addiction is addiction. In certain ways it was like having a mirror held up to me. I was able to feel directly how my actions were affecting others. If we were going to move on together, get married and have the kind of life we wanted, there was no room for any extra baggage. We set the date for our wedding two days after Michael quit bartending and drinking all together. Recovery is an ongoing process, and I hope I will be in it forever. It's not a matter of life or death anymore, but more so about becoming a healthier person mentally and physically. My friends and family are an amazing support, but I have only "recovered" because I wanted to. People don't just say that because it sounds pretty. You have to want to get better, and I did. Also Yoga, it helps a lot. Thank you Mr. Pearson! Michael: I had been to rehab facilities twice before coming to AMDA. While at AMDA I was most definitely still struggling, but was much better and brighter when compared with my lowest days. After AMDA, my drinking went up considerably when I no longer had deadlines and due dates to do the things that were necessary for my career after school. I continued to study my craft, but never made it to early calls or worked on my work farther than theory and notes. Then I booked a feature film and moved back to NJ where I tried to clean up again. I went to rehab one more time. I never let myself get as bad as I was again however I didn't allow myself to forgive myself for what I had done to my friends and family nor completely stop those flashes of an addiction until after I met Mariya. It took someone loving me as much as she does and constantly being there to see through my justifications and half truths to know I needed to stop this for good. At the start of forming Nunya Productions I stopped drinking completely. What have those experiences brought to your work and your life today? Mariya: I do not live from a place of regret, but I know that I have wasted a lot of time on things that have taken away moments from my friends, family, and my dreams. I now look at every opportunity with great appreciation because I could have lost it all. I am very dedicated and focused on what my goals are for my career and my family. I allow myself to work through problems now without going for the immediately wanted vice because I know that going down that path is destructive. I am thankful for my flirtations on the darker edge of sanity because of course those are elements I can bring to characters that I play. Really, it's in all of us, and I just brought mine a little too close to the surface. No person is all angel or devil, sane or crazy and I keep that in mind when making character choices. Michael: I wouldn't change anything. The struggle I put myself through has made me as strong as I am today. My experience has shown me that my life and my career is what I make it. It doesn't have to be miserable or bitter or unhappy. Tell us about how and when you decided to start your own production company? Mariya: The opportunity to start our own production company came to us by chance. Several years ago we were both part of a theatre company that was unfairly disbanded. All the members still wanted to continue putting on productions. At the time, Michael had the funds and we decided that we would put the show (U.S Drag) up ourselves with Michael as the producer. We were sitting around on our couch one day, deciding if this was something we wanted to pursue while also trying to find a name for our production company. That's when I said Nunya! (None yo business) because it was something Michael used to say jokingly to me. The name just stuck and it still makes us laugh. The decision to pair each production with a charity or cause came organically. Our show was going up right when the big earthquake hit Haiti, and it just felt right to do something good. Actors have to be self involved because we are constantly selling ourselves. It's refreshing to do it for someone else. Michael: We started Nunya so that we could perform great plays during a time when there were fewer opportunities available. We decided to make our own opportunities and while we are at it, give back in some way through our love and our craft. We want to show how art can influence other aspects of life directly. We struggled and managed to pull ourselves out, so now we want to help others to do the same. U.S. Drag was the first play you produced. You received an amazing amount of positive press. What was that experience like? Mariya: Most of the credit needs to go to Michael for this production. It was the first time for us to be with a production in NYC from beginning to end of this size, so we thought that anything was possible. We never approached it from an "well, this just won't be possible" angle because we had never done it before, and that helped us surpass our own expectations in the long run. It was a great motivator in us going forward with Nunya and making it an LLC. Our first attempt produced results, so it showed that with more hard work and experience, and the help of this city's amazing artists, we can really make a splash. It's an incredible feeling when you put your dreams in your own hands. Michael: Producing US Drag felt a lot like the start of AMDA for me, a new start. I had just come off of knee surgery and was getting out of bar tending (details in the backstage article titled "Recovery and Starting My Own Theatre Company"). I have worked behind the scenes on countless concerts, plays, and recitals through my parent's performing arts schools (The King Centre for the performing arts and the New Jersey foundation for dance and theatre arts) and this was the time to finally take all of those experiences from AMDA and my childhood and put them to practice. It felt GREAT. I felt a strong connection to my mother and what she has been accomplishing in front of me for most of my life (and still is today). We received an overwhelming and positive response from the author, press, and our audience. A perfect start to both our philanthropic and production aspirations. Now you are producing and acting in the new version of Neil LaBute’s Some Girls. 80% of the profits will benefit the organization “To Write Love on Her Arms”. Why did you choose this charity? Mariya: I stumbled upon an article about To Write Love On Her Arms and knew instantly that that was going to be Nunya's next cause. TWLOHA's story and message rang very personally with me. I wish I had known about them when I was younger. Michael and I are in such great places in our recovery, places I believe neither of us thought we could be in. I think it's really important that others know that recovery is possible. It made sense to combine our passion for theatre with a benefit for recovery. For us, one would not be possible without the other. You need to have a love for yourself in order to grow up and get what you want out of life. I am thrilled to have TWLOHA's support on this endeavor. Michael: We chose TWLOHA because we wanted to have a more personal connection to our cause. TWLOHA helps people struggling from issues we both know very well. They are an amazing movement and resonated as a perfect fit for our charity. It is quite an undertaking and accomplishment to stage a play in NYC and get the kind of attention you have gotten. You both have to wear many hats…fundraiser, publicist, actor and producer, what are some of the things that you have learned throughout this process? Mariya: Many hats, and shoes, and coats, and scarves! It is hard, but we made a decision early on that we wanted to keep the core of this company to just the two of us. We both understand and value hard work which makes it possible for us to accomplish putting up a show, but for each production, we have been extremely fortunate to have very talented directors (Michole Biancosino for U.S. Drag and Roger Del Pozo for Some Girls), actors, and the invaluable Rome Brown (also an AMDA alum). I have learned that no matter how big the crisis is (we have had many!) that there is always a solution, even if it's not the ideal one. Michael: Wearing as many hats as we do during this process is stressful of course. We have pretty much put all of our time into the project. We are lucky enough to have each other during this process to bounce ideas and encourage when things fall through or get frustrating. Having the right people around you when putting something like this together is the most important thing. We found actors and directors who were not only talented, but hard working and passionate to our cause. We hired AMDA alumnus Rome Brown as our lighting & stage manager. We worked with him on US Drag and knew he would put his blood, sweat, and tears into the show. Mariya: I am currently involved in a great project called Lost & Found. It is the first all Russian Jewish theatre troupe in Manhattan and is an experimental project based on collective personal family stories from before and during Russian Jewish immigration to the US. I am really excited about this. We are slated to open in March and have plans to go on tour to Canada, Russia, and maybe more! Michael: After this production is over, Mariya and I will finally take a trip together. We produced a play, a wedding, and now another play without much of a break, so we are going to be sure to do that. Mariya: Next we want to get first production rights for our next play. We are just looking for the right original script to do that with. Feel free to email any suggestions to us. We would also like to secure a longer run for our next show and take it on tour. Our main focus has been theatre, but we would like to do something in film as well. Michael: Right now I only have one focus: This new version of Some Girls. We have a great cast, lots of press in the works, and very eager Nunya supporters ready for our opening. What advice do you have for current AMDA students and recent alumni? During your time at AMDA, put in the work. It will benefit you. Go to the extra warm ups, VPS and dialect classes even if you feel its something you will never use. Go on every audition you can get. Networking is everything! 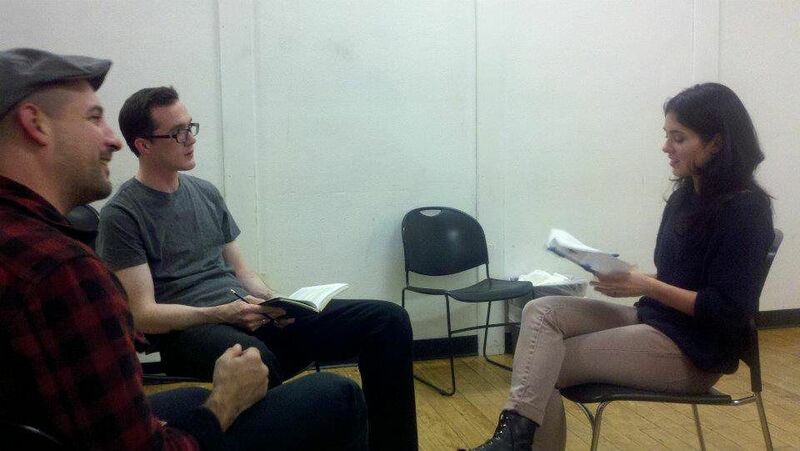 The artists you work with today are tomorrows casting directors, agents, directors, editors, and writers. Hustle. I remember being told this at AMDA and it’s true you really have to hustle. Work to create a strong sense of self. If you do not believe in yourself, it is visible. And even if you booked a role, if you have a negative attitude, people will not want to work with you again. Michael: This may all seem a little cliché but I have found it to be very true. Remember that school is just the beginning of your learning process. It may take another year of studying to understand your first semester and another 19 years to be closer to mastering your craft. Go out and make your career what you want it to be. Every job is a learning experience so take the positive and leave the negative behind. Keep moving and learning. Life will step on you if you don't keep moving. Thank you both for sharing your personal stories with us. Nunya’s Production of Neil LaBute’s Some Girls will debut on December 8th – December 17th at the American Theatre of Actors' Sargent Theatre at 314 W. 54th Street in NYC.